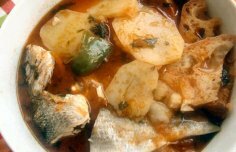 This Portugue soup is a complete meal in a bowl with the nutrient rich sweet potatoes and spinach and protein from the beans and chouriço. In a large soup pan, combine all the ingredients except for the spinach. Bring to a boil. Reduce the heat to medium and cook for 45 to 50 minutes, or until potatoes are tender when pierced with a fork. Remove the chourico and let it cool. Chop the chourico into cubes and fry them in a dry pan until they are crispy. Reserve. Remove the bay leafs from the soup. 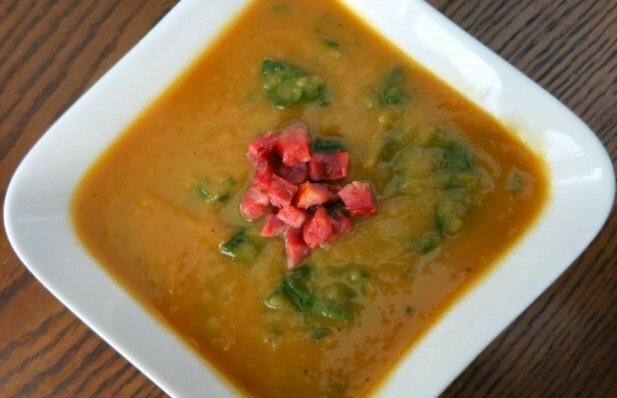 Transfer soup to a food processor or blender and puree in batches until smooth. Transfer soup back to the pot and add the spinach. Cook spinach until it’s wilted. Adjust seasoning with salt, pepper, nutmeg and smoked paprika. 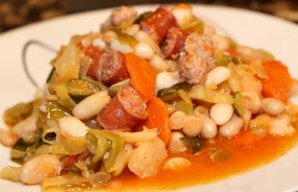 To serve, ladle soup into bowls and garnish each serving with a few chourico cubes and a drop of extra virgin olive oil.